How to Create Static Home Page in WordPress? WordPress by nature is a blogging tool made for creating easy blogs and over the period of time the capabilities are extended to use the same blogging features for creating a static website. Most of the time neither blog nor static content site satisfy your need and the preferred option is to run a blog with limited static pages. When you run a WordPress blog, by default the home page is assigned to a blogroll page displaying the latest blog posts. 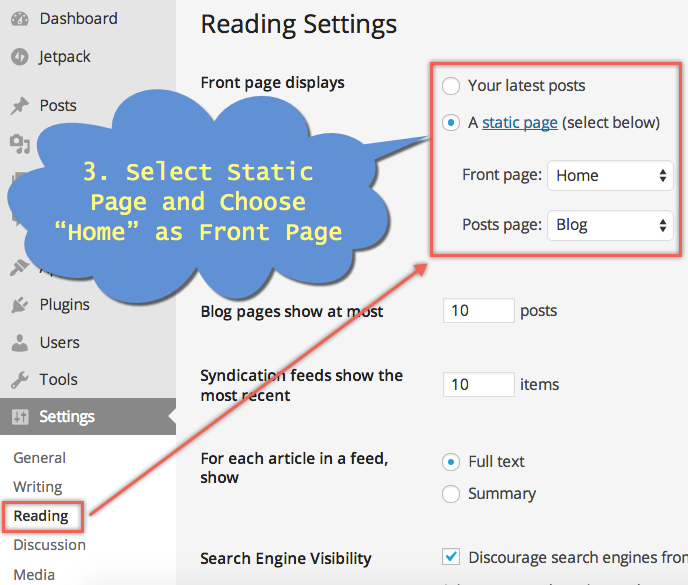 Follow the below step by step instructions to create a static home page in WordPress. Create a new page with the title as “Home” and add your page content. This is your static home page and create your home page content as normal. Next create a page with the title “Blog” and DO NOT ADD any content. This will be your blogroll page displaying the latest blog post. Save your changes and view your site in browser. Home page will be added in the menu showing your front page content. If the menu order is not corrected or if you see two “Home” page in the menu go to the next step. Navigate to “Appearance > Menus” and check or create your menu. You will be seeing two “Home” pages in the selection and ensure to add only one “Home” page to your menu. Arrange the order by dragging the items up or down and save your changes. Now check your site in browser and the “Home” page will display your landing page content and the “Blog” page will display the latest blog posts. Set number of posts to be shown on the blog page under “Settings > Reading > Blog pages show at most”.